Be sure to check out my interview with Steve from early this morning, along with the Vostok giveaway! 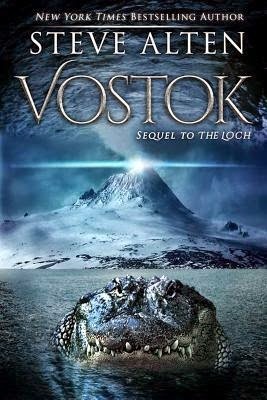 Steve Alten's Vostok is an odd book, a science fiction themed adventure that dabbles in several different genres, teasing the reader with multiple scenarios and plot lines, before making a major leap in theme that demands a little patience and trust on the part of the reader. It pays off, if you stick through to the end, but there's no doubt that the transition is a little jarring. Really, this is a book that has it all - good old fashioned monster horror, Jurrasic Park style science fiction, Lost World underwater adventure, cold war style espionage, and the most paranoid of conspiracy theories involving crashed UFOs and the origin of human life. Fun stuff, no doubt about it - a bit cheesy, to be sure, and it does stretch the willing suspension of disbelief, but it never loses it sense of fun and adventure. Our hero, Zachary Wallace, is a disgraced marine biologist who has exhausted his 5 minutes of fame. Having proven the existence of the Loch Ness Monster by killing the same mythical beastie, he's become a pariah to his family, friends, and neighbors. He initially turns down the offer of spending 6 months in Antarctica to save his marriage, but a series of clever plots, betrayals, and double crosses ultimately put him in a position where even his wife insists he take it on. It's all a bit cruel, and you feel bad for the poor guy, but it's great fun. Once in Antarctica, the story gets even crazier. What was initially only supposed to be a deep-sea submersible exploration of microscopic Mesozoic life forms turns into a frantic, desperate battle for survival against prehistoric sharks, whales, and more. To make matters worse, he discovers he can't trust either of his two crew-mates, and can trust the government agents back on the surface even less. There's a massive magnetic anomaly deep beneath the ice, and as much as Zachary wants to believe its some remnant of an asteroid impact, he can't shake his crew-mate's insistence that it's a crashed UFO. The other characters are a bit stereotypical, and the action is pure bubble-gum action adventure, but there's also some interesting science and politics behind it all. I can't speak for how accurate it all is, but Alten does a good job of selling the story, making it all sound authentic. Like I said, that late-stage shift in the story is jarring, and it completely changes the tone of the story, but it works. I wasn't sure how he'd resolve everything, especially with the introduction of the final theme of the novel, but so long as you have an open mind, and can enjoy a little fantasy mixed in with your science, it's all makes for an interesting journey to Vostok and beyond. I really enjoyed this story, despite the cheese and the outlandish plot, it certainly kept me entertained!